Researchers at the Karolinska Institutet and the University of Oslo in Norway used DNA origami to demonstrate the most accurate distance between densely packed antigens in order to get the strongest bond to antibodies in the immune system. The study (“Binding to nanopatterned antigens is dominated by the spatial tolerance of antibodies”), which was published in Nature Nanotechnology, may be of significance to the development of vaccines and immunotherapy used in cancer, according to the scientists. “Although repetitive patterns of antigens are crucial for certain immune responses, an understanding of how antibodies bind and dynamically interact with various spatial arrangements of molecules is lacking. Hence, we introduced a new method in which molecularly precise nanoscale patterns of antigens are displayed using DNA origami and immobilized in a surface plasmon resonance set-up. Using antibodies with identical antigen-binding domains, we found that all the subclasses and isotypes studied bind bivalently to two antigens separated at distances that range from 3 to 17 nm,” wrote the investigators. “We have for the first time been able to accurately measure the distances between antigens that result in the best simultaneous binding of both arms of different antibodies. Distances of approximately 16 nanometers provide the strongest bond,” said Björn Högberg, PhD, professor at the department of medical biochemistry and biophysics, Karolinska Institutet, who led the study. The study also showed that immunoglobulin M (IgM), the first antibody involved in an infection, has a significantly larger reach, i.e., has the ability to bind two antigens, than previously thought. IgM also has a significantly greater reach than the IgG antibodies produced at a later stage of an infection. 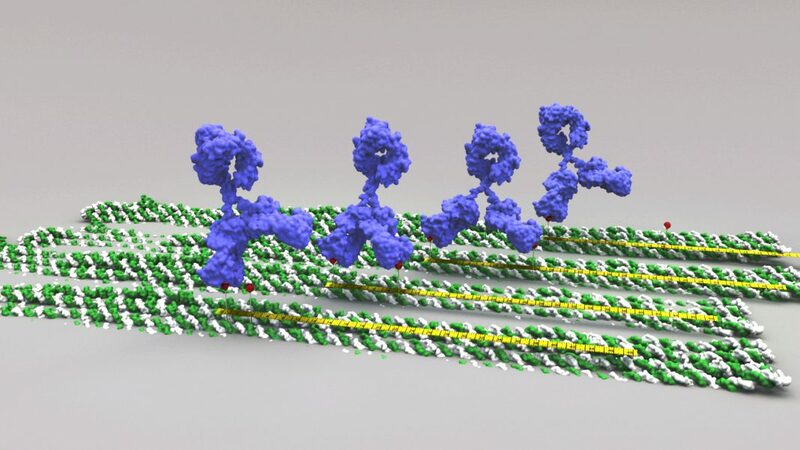 “By putting antigens on these DNA origami structures, we can manufacture surfaces with precise distances between the antigens and then measure how different types of antibodies bind to them. Now we can measure exactly how antibodies interact with several antigens in a manner that was previously impossible,” said Högberg, who added that the results can be used to better understand the immune response, for example, why B lymphocytes are so effectively activated by particle display vaccines, and to design better antibodies for immunotherapy when treating cancer. The research was conducted in close collaboration with the Laboratory of Adaptive Immunity and Homeostasis led by Jan Terje Anderson, PhD, at the University of Oslo and Oslo University Hospital. “We study the relationship between the structure and function of antibodies. Such insight is important when we design the next generation of vaccines and antibodies for tailor-made treatment of serious diseases. We have long been looking for new methods that can help us get detailed insight into how different antibodies bind to the antigens. The collaboration with Björn Högberg has opened completely new doors,” said Andersen.